I had some experiences using clay back in high school but never on the wheel. My friend Glenn Schlikas was much better with clay than I was so I was always playing catch up with him. For one project he made a Rocketeer sculpture complete with a billowing smoke base. I think he remade that whole piece 4 times in the same amount of time it took me to make my little alien head. At the end of our senior year we collaborated on a large 8 foot tall (was it taller?) clay sculpture that we then cast in fiberglass. It was the senior class gift. We had a love/hate relationship with it and nicknamed it “The Torch Monster” because it was topped off with a hand holding a torch to mirror the Statue of Liberty. I sometimes wonder if it is still there, but I haven’t been back inside the school to see. but what kind of DJ name is Glaze? Your comics are always great for picking me up in the morning before the coffee. hmm I used to be pretty good with clay back in the days when it was still called play dough. Oh man, this brought up some great visual images. I think this is possibly my favorite Biff strip of all! Go creative teaching methods! Sorry if I’m late to the “What theme is this week?” game but it’s class/learning week, isn’t it? I saw a guy dj with clay once at a show called La Vie by Spiegelworld at Southstreet Seaport in NYC (it was a kind of new circus performance so he wasn’t ACTUALLY djing with clay). The guy used a turntable and balls of clay and each ball played a different part of a song when he put it on the turntable. So he mixes and matches them and plays with them for a while in kind of a slapstick way before putting them altogether into a big mound and slapping them on the turntable. At which point you realize that the song he was assembling was the song that played during the pottery wheel scene in Ghost with Patrick Swayze. Hilarious because the theme of this circus was the afterlife. Thanks for doing a good comic and reminding me of that awesome performance. As for high school art I’m sad to say it usually does not survive after the artist has left unless it is fairly tame; My co-op mural of a robotic wyvren battling a super intelligent ape (3 person job, about 16 f, 8 f) was painted over a single year after we graduated (Its nice to have friends younger then you sometimes) while ‘Horse running in a Meadow’ has been up going on 7 years now. @Lesley – UNDER the science hallway? How do you even know about it? Throwing clay on the wheel is much more complicated than they make it look on television. The cool thing about it, though, is that even if you mess it up, it usually comes out looking pretty neat. *laughs* Oh man I literally laughed out loud at his one! That is so funny. You Rock!!! Maybe Lesley did what I did in college–spend all my free time exploring the buildings. Pottery class: Headphones tuned to DJ Glaze. I’m kind of wondering if some of the projecting I left behind at my old schools are still there too! And now that I’m wondering what Biff’s headphones are plugged into, did the Mythbusters ever prove that music could be recorded into pottery? I noticed Biff showed a lot of different emotions this week, which is rare when your face is like Biff.. In this one he actually looks happy. His mouth seems awfully small in this one. 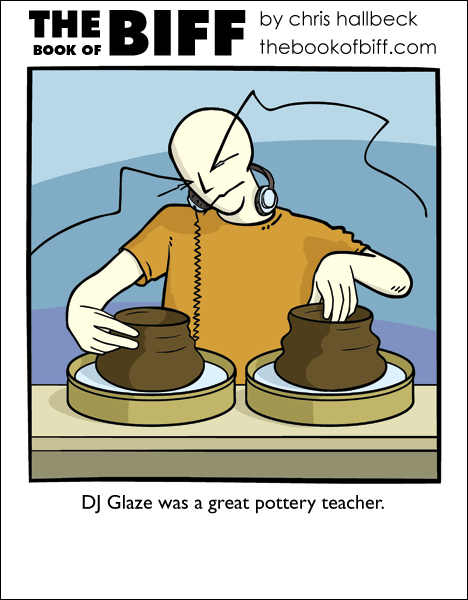 hm….clever, clever, I’m guessing the pottery teachers name is DJ Clay. whoops didn’t read right, sorry.